03.08.1953 - 31.03.2019 In our hearts and loved always. Loving husband to Leng, amazing dad to Jess and Rory, welcoming father-in-law to Pat and Megan and coolest grandpa to Issy, Harry and Dawn. 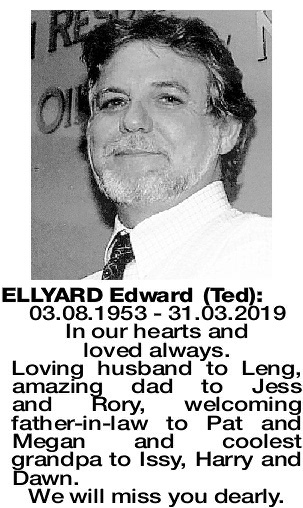 A Ceremony to celebrate the life of Edward (Ted) Ellyard of Perth will be conducted in our Chapel, 442 Scarborough Beach Road, Osborne Park on WEDNESDAY (10.4.2019). Arrive from 1.30pm for a 2.00pm Service. 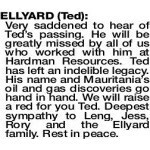 Please join us for a drink afterwards to toast Ted. 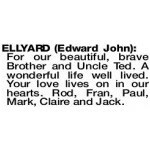 For our beautiful, brave Brother and Uncle Ted. A wonderful life well lived. Your love lives on in our hearts. Rod, Fran, Paul, Mark, Claire and Jack. Passed away 31.3.2019. Deepest sympathy to all loved ones. RIP. Love brother Ian and Rose. 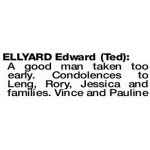 ELLYARD TED In loving memory of a great man and uncle, you will be remembered dearly. 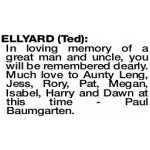 Much love to Aunty Leng, Jess, Rory, Pat, Megan, Isabel, Harry and Dawn at this time - Paul Baumgarten. 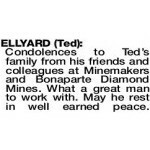 Condolences to Ted's family from his friends and colleagues at Minemakers and Bonaparte Diamond Mines. What a great man to work with. May he rest in well earned peace. 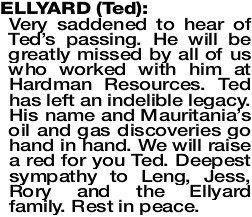 ELLYARD TED Very saddened to hear of Ted's passing. He will be greatly missed by all of us who worked with him at Hardman Resources. 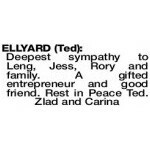 Ted has left an indelible legacy. 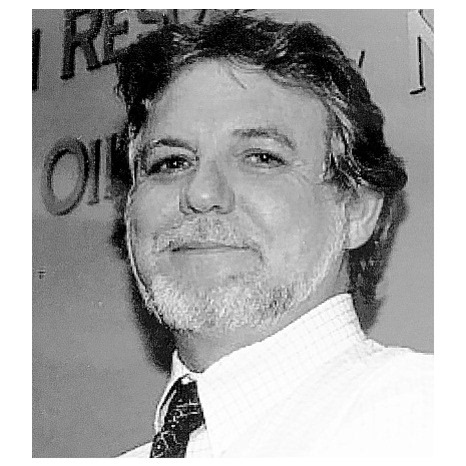 His name and Mauritania's oil and gas discoveries go hand in hand. 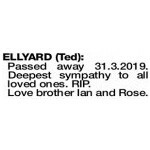 We will raise a red for you Ted. 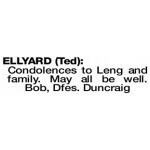 Deepest sympathy to Leng, Jess, Rory and the Ellyard family. Rest in peace.